SPARTAN STADIUM PHOTO PICTURE MSU Michigan State Spartan Stadium AERIAL picture photo print poster for sale. 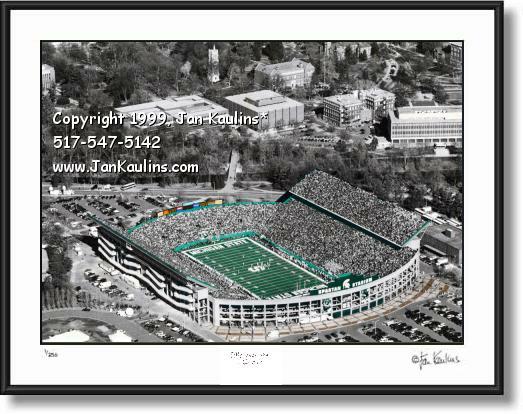 Michigan State SPARTAN STADIUM black and white hand colored aerial photo picture print photography for sale. MSU Michigan State Spartan Stadium aerial picture photo art print for sale. This MSU Michigan State University Spartan Stadium aerial color picture photo of MSU Spartan Stadium was made from an ORIGNAL BLACK AND WHITE PHOTO THAT HAS BEEN HAND-COLORED by nationally recognized artist and photographer Jan Kaulins. This exceptional aerial Michigan State picture photograph of the MSU Spartan Football Stadium was taken during the Nov. 6, 1999 defeat of the MSU arch-rival Ohio State (MSU 23/ OSU 7). In this MSU aerial Spartan Stadium picture photograph we see the crowd filled sold out 72,027 seat stands and part of the beautiful campus in the background. This is now a rare aerial MSU Spartan Stadium photograph view, as, since the tragic events of 9/11, low flying small planes are prohibited from flying over large public sporting events like this MSU football game. This aerial view of the Michigan State University Spartan Stadium at MSU (which was built in 1923 and enlarged to its present size in 1957) in this historic MSU picture photo also shows some of the adjacent Michigan State University campus buildings in the background, including The MSU Library and landmark MSU Beaumont Tower. This aerial Michigan State photo of MSU Spartan Stadium would be a great gift for any student or member of The MSU Spartan Alumni Association! TO SEE OTHER MSU AND SPARTAN STADIUM PHOTOS JUST CLICK ON THE 'BACK TO MSU...' LINK NEAR THE TOP OF THIS PAGE ABOVE THE SPARTAN STADIUM PHOTO.